This collection of 77 short poems of Eino Leino represents a narrow selection of the vast spectrum of Leino’s literary production during his short, multifaceted and tumultuous public and personal life. 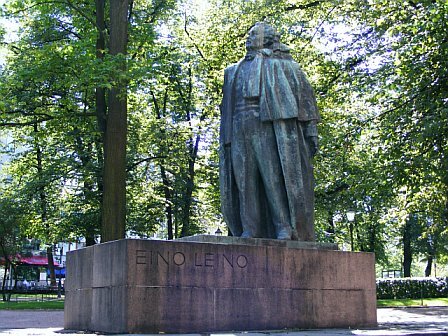 Eino Leino is justifiably idolized by the Finnish poetry lovers as the greatest poet of the Finnish written languish, following in the footsteps of the vast oral tradition of Finnish epic poets and rune singers documented in “Kalevala”. Born in 1878, Leino started writing poems already in his teens, and he was 18 years old when his first major collection was published, followed by 31 other poetic collections among other literary works. Leino was the leading force in the creation of the foundation of the Finnish poetry during its formative years amid the rising nationalism of the nation aspiring for independence during the last period of the Czarist Russia. Leino’s life cycled through periods from celebrated acclaim and elation of the spirit to extreme frustration, poverty and rejection. As a fiery activist in the evolving cultural, social and political life of the Finnish society, Leino was a sharp critic of the prevailing establishment at any given period, and the elite turned at times strongly against him. His three marriages all failed almost from the beginning. The poet was unyieldingly clinging to the freedom of his personal life, and at the end the freedom of his spirit was the only thing left from his idealism. A few loyal friends tried to sustain his spirit through the turbulent cycles of his life that already early on revealed traits of manic-depressive behavior. He escaped to extremes of bohemian life that gradually ruined his health and drove him into a sustained clinical depression. Leino died in 1926 at age of 47 years. The poems selected reflect deep passionate love and desperation of love lost. They also reflect the closeness of the poet to the nature around his childhood home on the northern shore of Oulujãrvi, a large lake in North-Central Finland. The poems selected are arranged in chronological order by the year of the publication of the source collection, ranging from 1896 to 1925. Translation of poems is always a demanding task. This is particularly true in attempts to translate Finnish poems into English because of the intricacies of the Finnish language which is rich with descriptive words and expressions that often have no counterpart in English. Finnish words tend to be long. Each noun has 16 cases with different endings in everyday use. The adjectives are inflected same way as the nouns, and the base of various types of verbs changes differently with inflection although the endings change in a similar way. This actually facilitates composing poems with a formal structure in Finnish. In English translation however, it is easier to make the translated poems rhyme than to retain the rhythm because of these vast structural differences of these two languages. The English product is at best, an adaptation.